Happy Weekend! I'm thrilled to see Friday and even more ecstatic about the sunshine that's forecast for this rainy town. Little side note: Atlanta has had more rain this summer than Seattle, Washington. Sad, just sad. Anyway, I digress. 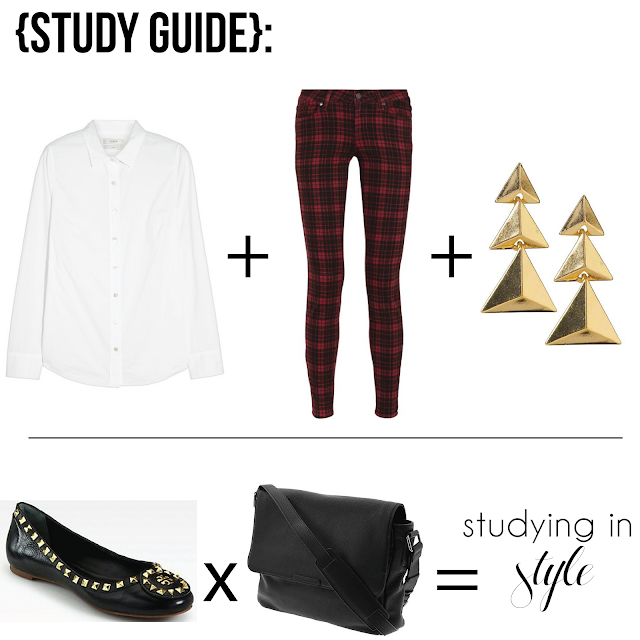 With all the kiddies back to school, here's an outfit perfect for hitting the books. Nothing says back to school quite like plaid. I'm guessing that comes from my many years of wearing school uniforms! I saw these jeans and knew they were perfect for this back to school outfit. I paired them with a white shirt (also very reminiscent of my old school uniform), fun earrings, an essential messenger and edgy flats. I don't know about you but I could get some serious studying done in this little number. Thanks for all the birthday wishes this week. Y'all really know how to make a girl feel special! Here's wishing you a lovely weekend!